It’s not the destination, it’s the journey. Of course, once you get to your destination, you are bound to take some photos of the scenery to commemorate your accomplishment of getting there on your beloved smartphone. That being said, not having the right lighting or getting a blurry photo can be a pretty big letdown for all the hassle of trekking to just the right spot to take the picture in the first place. While you don’t need to buy a nice DSLR just to take a selfie on a mountain or in the forest, there’s nothing wrong with wanting a bit of help getting a clearer picture. There are all sorts of options for lighting accessories on a smartphone, but that won’t improve the focus of your smartphone’s camera like the AUKEY Ora 2-in-1 Lens will. 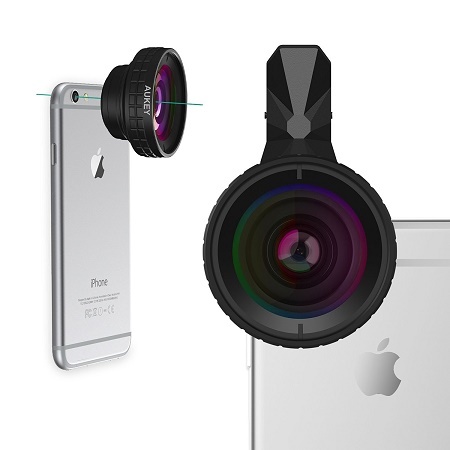 This has a 140 degree wide angle lens as well as a macro lens capable of 10X magnification. Made of aluminum and multi-element coated glass, this will make sure you don’t have to deal with much in the way of ghosting, reflections, lens flare, or any other artifacts. The clip is made of rubber, and will help to prevent this accessory from leaving any marks behind if you want to take this off of your phone. It’s not super cheap at $24.99, but if it cost any less we would all doubt its abilities. There are always higher ticket items like this for better smartphone photos, but if they cost much more, you may as well start saving up for that DSLR.